A new kind of Pokémon trading card game, perhaps? There's nothing quite like a mysterious patent to get chins wagging and brains ticking over. And this latest one from Nintendo is a right head scratcher. 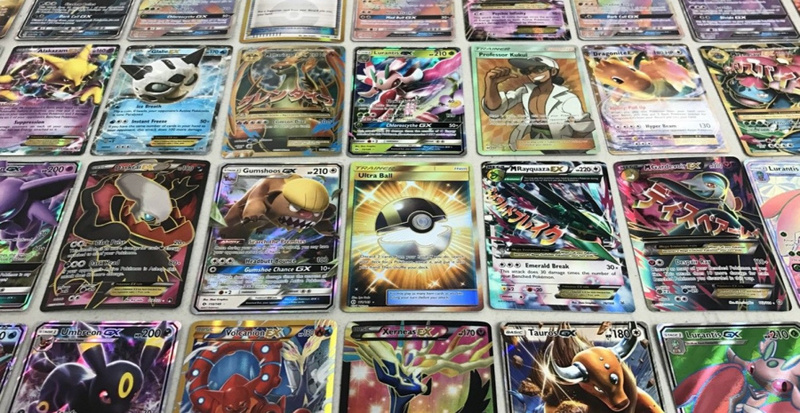 The patent, which was filed earlier this month to the United States Patent and Trademark Office, present a set of collectible trading cards with in-built NFC functionality (making them, in theory, function much like a traditional amiibo). So what could it all mean? This isn't the first time Nintendo has used NFC in card form - Animal Crossing: Happy Home Designer used a set of collectible cards that included such functionality, so could this be a prelude to a similar set in 2018? Pokémon remains a big player in the CCG space, so there's always the possibility that we could see Nintendo riff on that powerful licence. My bet would be a new Smash range but in card form. Less manufacturing costs on figures and can be sold in blind packs. Pokemon RPG tie-in... has to be... can you imagine the sales?! Nintendo are not stupid. I think these will just replace amiibo. Said the same when the animal crossing ones hit, just added give it a couple years. Well, it's been a couple years. A lot of stores don't like the shelf space being taken up, and have pushed all these types of toys to life, off to corners and endcaps. But boxes of card packs can fit anywhere, and in existing displays with little real estate taken up. Those design drawings are weird. Althought it has the dice and rock-paper-scissors of the AC cards..maybe they just forgot to patent them before? I've thought that having amiibo Pokemon TCG cards would be awesome for a while now. It would allow for card games to be played through the switch with visual effects and everything. Would also allow for you to play with people online, which would be crazy cool. This would probably be the only way Pokemon could be properly shown through amiibo as here are so many of them. Another Animal Crossing cards ?? Maybe some kind of marriage between traditional TCGs and digital ones like Hearthstone or MtG Online? Like you buy a booster pack, scan the cards and you have parity between your physical and digital collections. @PhilKenSebben That's what I suspected originally as well. I KNEW they were rushing Pokémon out for this year! Those starters look rubbish! Lol. But in seriousness, I would think they would've made a RPG tie-in with the whole amiibo range and/or make more amiibo based games. I have zero interest in cards, especially if they are in blind packs. I don't like paying for something when I don't know what I'm getting. Amiibo at least had the thing of doubling as a display collectors piece. @jump I'll bet it's the new water starter for the next Pokémon game. 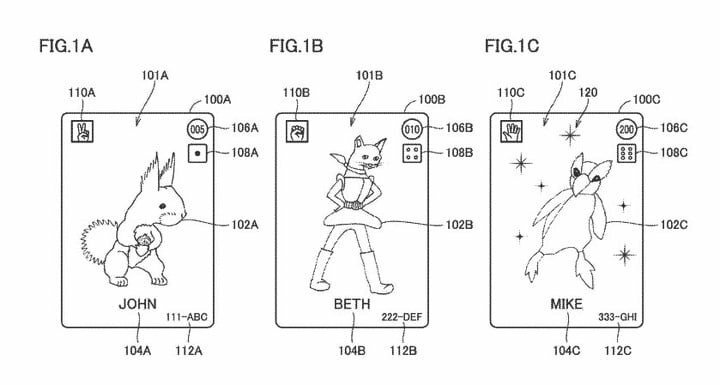 The patent looks exactly like the Animal Crossing cards. But I kinda hope for Smash Cards. I love amiibo but I hate the blind bag amiibo cards. I still want to complete my amiibo collection, but these things make it much more of a chore to complete it than it really has to be. Intriguing. Feels like it could be a new TCG that either links up with the new Pokemon game that's in development, or the new SSB. I don't think they'll replace the Amiibo though. Whilst it's unlikely we'd see a whole new range of Amiibo for SSB, I do think we'll see any new characters added to the existing SSB Amiibo range. Seems like a weird time to patent NFC cards after not only Animal Crossing cards but Mario Sports Superstars cards as well. Saw a few packs of the latter hanging on a hook in Target last week. Pokemon cards makes the most sense. Those cards still sell like crazy and it always only seemed a matter of time before the cards starting getting NFC chips put into them. And with over 800 Pokemon the toys always seemed a bit ambitious. I could see a NFC Pokemon card game playing out like PS3's Eye of Judgement, only easier w/o a camera, just scan the cards. OMG is Animal Crossing Switch!!! All the WiiU ports we already know, Kirby, Yoshi, Fire Emblem, Animal Crossing and Smash 5. BOOM!! 20m Switch systems sold just like that. @subpopz: "I have zero interest in cards, especially if they are in blind packs. I don't like paying for something when I don't know what I'm getting. Amiibo at least had the thing of doubling as a display collectors piece." I totally agree. I absolutely do not like blind card packs. I remember when the (Gameboy Advance) e-Reader had cards released. You could buy 1 Nes game in a pack for, I think, somewhere between $5-$20, or less. It was the complete game. If I remember correctly, the Super Mario Advance 4 packs were somewhat similar, but only 1, or 2 of those level packs were sold here in the States. Amibo cards compatible with mobile (for acpc, feh, mkt, zelda, yokai watch, pokemon, snack world, inazuma, layton? etc.etc.etc...? Gonna make a Beth deck. @rjejr I believe this is literally the Animal Crossing card patent. The Right of Priority of Foreign Application grants anyone priority who had registered a patent in a foreign country before. Nintendo was in no hurry to register this elsewhere. Anyway, this took me no more than three minutes of googling. Journalism 101. Can't expect much these days, eh? I think card amiibos would be alot more practical for there limited usefulness. Toys to life was a neat concept when it was new, especially when they unlocked an actual game character, but they’re really just statues, not actual toys, a collection takes up alot of space and is extremely expensive. I only have 2 amiibos, blue yarn Yoshi, and an Animal Crossing amiibo. Both were on sale. I might eventually get Megaman if I can find it. Cards would be way better, because not only could they produce and sell them cheaply, but you could keep your entire collection with you in your Switch case. I don’t like the idea of blind packs, though. I’m much more likely to try to collect something when I know what I’m getting. I’d probably end up looking for the ones I want on ebay. @Octane Close, but not quite correct. This is a continuation of Nintendo’s 2015 amiibo card patent. I don’t have time to go over it with a fine-toothed comb, but extending the idea of amiibo cards into the TCG space does seem to be the general new thrust here. @Octane Thanks for all the good work. Those rock-paper-scissor hand signals are too spot on to be a coincidence. Just remembered I bought AC:aF at TRU a couple of weeks ago for $5.98 - wanted something to remember them by - so I think I own 3 of these, still haven't opened the box, been playing H:ZD and Kirby. My sons and I decided I may be the only person in the world to finish the story in both Uncharted Lost Legacy and Kirby Star Allies this weekend. H:ZD has about 30 more hours to go. Beth is my spirit animal. @Yosher Exacty why I gave up on cards and collect solely figures now. Basically to my understanding its a continuation of the patent to create NFC trading cards. I will admit though i don't usually delve into patents, so I could be 100 percent wrong, I just wanted to check this one out to fact check Octane, since he was the only one saying anything about it, and i believe he is right. There's also the Shadow Mewtwo amiibo card from the Wii U version of Pokkén Tournament. I have wanted Pokemon Amiibo Cards since the start. But not a separate card game. Added to the cards, much like the old e-Reader Pokemon cards. It would be an AWESOME way to connect the video games and the card games. Imagine a full collab between Pokemon Switch and a new generation of the card game. The card game could remain doing it's own thing like always, but then scan certain Amiibo cards in the Switch game to unlock special NPC opponents, get mystery gifts, battle wild Pokemon with their hidden abilities instead of their normal ones, or have egg moves right from the start! Amiibo cards could serve as the new EX/Lv.X special cards in future sets, as well as the full art or secret rares. Of course having every common card be an Amiibo card would likely raise the price too much. So they could do it like the older reverse foil cards, 1 per pack that sometimes is a full art or secret rare. I could even see certain secret rare cards of shiny Pokemon letting you battle and potentially capture shiny Pokemon. Which would be wonderful for those of us who don't cheat to hack all our Pokemon Shiny. I still don't think this is likely, but man, I would love it! I would give anything if they reworked the Fire emblem card game into an NFC version sorta like the Eye of Judgement on PS3. Not gonna happen but I can dream. New cards for the Animal Crossing Amiibo Festival port? They would be so much easier to carry on the go! Nintendo just can't stop with all the lovely cardboard, can they? is this the start of some true yugioh battles ?? This would be an interesting turn in the Pokémon TCG community. I’d rather see TCGO on Nintendo Switch over Hearthstone. Didn’t think that way before, but now my boys and I collect Pokémon cards. I see way more potential behind a Pokémon game like that on Nintendo Switch. The physical cards hold way more value, and the player base seems friendlier compared to Hearthstone.